Periodically, the state of bariatric surgery worldwide should be assessed; the most recent prior evaluation was in 2003. An email survey was sent to the leadership of the 36 International Federation for the Surgery of Obesity and Metabolic Disorders nations or national groupings, as well as Denmark, Norway, and Sweden. Responses were tabulated; calculation of relative prevalence of specific procedures was done by weighted averages. Out of a potential 39, 36 nations or national groupings responded. In 2008, 344,221 bariatric surgery operations were performed by 4,680 bariatric surgeons; 220,000 of these operations were performed in USA/Canada by 1,625 surgeons. 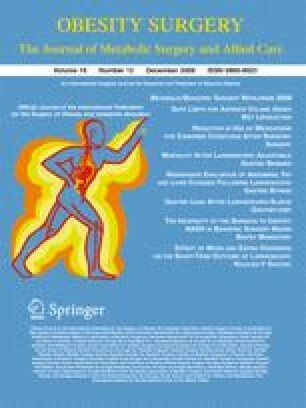 The most commonlyperformed procedures were laparoscopic adjustable gastric banding (AGB; 42.3%), laparoscopic standard Roux-Y gastric bypass (RYGB; 39.7%), and total sleeve gastrectomies 4.5%. Over 90% of procedures were performed laparoscopically. Comparing the 5-year trend from 2003 to 2008, all categories of procedures, with the exception of biliopancreatic diversion/duodenal switch, increased in absolute numbers performed. However, the relative percent of all RYGBs decreased from 65.1% to 49.0%; whereas, AGB increased from 24.4% to 42.3%. Markedly, different trends were found for Europe and USA/Canada: in Europe, AGB decreased from 63.7% to 43.2% and RYGB increased from 11.1% to 39.0%; whereas, in USA/Canada, AGB increased from 9.0% to 44.0% and RYGB decreased from 85.0% to 51.0%. The absolute growth rate of bariatric surgery decreased over the past 5 years (135% increase), in comparison to the preceding 5 years (266% increase). Bariatric surgery continues to grow worldwide, but less so than in the past. The types of procedures are in flux; trends in Europe vs USA/Canada are diametrically opposed. Presented before the 14th World Congress of the International Federation for the Surgery of Obesity and Metabolic Disorders, Paris, August 27, 2009. This work was supported by Synovis Inc.
We thank the following individuals and nations, or national groupings, for providing the data for this survey: Argentina, Carlos Casalnuovo; Australia, Harry Frydenburg; Austria, Karl A. Miller; Belgium/Luxumbourg, Jacques Himpens; Brazil, Arthur Garrido Jr, Thomas Szego; Chile, Juan Hepp; Czech Republic, Martin Fried; Denmark, Lars Naver; Egypt, Khaled Gawdat; France, Jean Mouiel; Germany, Rudolf A. Weiner and Christine Stroh; Greece, Konstatinos Konstatinidis; Hungary, Janos Bende; India, Pradeep Chowbey; Israel, Asnat Raziel; Italy, Luigi Angrisani; Japan, Isao Kawamura; Mexico, Luis A. Iturribarria; Netherlands, Mauritis de Braw and Jan Greve; New Zealand, Robert Fris; Norway, Rune Sandbu; Paraguay, Roque Duarte Pedro; Peru, Eduardo Valdez; Poland, Mariusz Wylezol; Portugal, António Sérgio; Romania, Nicolae Iordache; Russia, Yury I. Yashkov; Serbia, Milan Colic; South Africa, Tess van der Merwe; Spain, Antonio J. Torres; Sweden, Johan Ottosson; Switzerland, Markus Naet; Turkey, Mustafa Taskin; Ukraine, Andriy Lavryk; United Kingdom, John Baxter; USA-Canada, Georgeann Mallory; Venezuela, Alberto Cardozo Pieranti. World Health Organization. Obesity and overweight facts. https://doi.org/www.who.int/dietphysicalactivity/media/en/gsfs_obesity.pdf. Accessed 10 Sept 2009. National Center for Health Statistics. Results from the 2003–2004 National Health and Nutrition Examination Survey (NHANES). https://doi.org/www.cdc.gov/nchs/products/pubs/pubd/hestats/overweight/overwght_adult_03.htm. Accessed 14 Sept 2009.